How To Install And Use A Sump Pump? 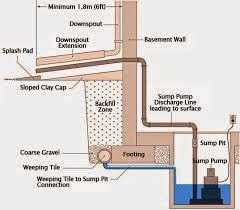 Sump pumps are used in order to remove water that has accumulated in the sump basin. There are two main types of sump pumps: pedestal, which is mounted right above the sump and submersible, which is mounted inside the sump, just as the name suggests. In this article you will find detailed information regarding the sump pump installation process and how you can benefit from these useful pumps. As stated above, these pumps aim to keep certain areas under buildings, usually basements, dry. In time, water can accumulate into the sump pit, and these devices are used in order to pump all the water out of it, in order to prevent water-related damage. If you do not deal with flooded basements in real-time, it may cost you thousands of dollars in the long run, not to mention all the health issues associated with increased humidity. Installing a sump pump is certainly not an easy task and it can take 6 to 8 hours, based on how thick the basement floor is. First and foremost, you need to determine where is the water coming from, since these pumps treat the effect, not the cause. Generally speaking, basements become flooded when water migrates through the soil. Blocked drains and sewers can also be the culprit behind flooded basements. Mark the outline of the sump basin on the concrete floor. This is an essential step which will help give you an idea regarding the section of concrete floor that needs to be cut. Use a heavy-duty hammer drill to help you break through the concrete. This is actually the most difficult part of the entire process. Another option is to use a demolition saw. This can make the whole job a lot easier, since these saws are especially designed for cutting through concrete. These tools can be rented for a few dollars an hour, so renting one is definitely a cost-effective solution. Before cutting through the concrete basement, make sure to clearly draw the perimeter line. Remove the debris and dig a hole that is deep enough for the basin. After you are done digging the hole, what you need to do next is to wrap the basin with filter fabric and afterwards insert it into the hole. Make sure the hole is deep enough and the basin fits perfectly before moving on to the next step. After the basin is in place, you will need to fill all the surrounding void with gravel. Add several inches of it. After you are done, you need to level the surface with a float and it is also recommended to lay a stone paver on top of the gravel. The stone will ensure that the gravel is well-placed. Set the pump right on top of the paver and connect the PVC pipe and the valve to the pump. You can do this using special PVC cement. After you have placed the pump, check the float position and make sure it is several inches away from the liner, so it can move around freely. Next, you will need to drill a whole through the wall in order to extend the PVC pipe to the outdoors. This is essential due to the fact that you cannot discharge ground-water into the plumbing system of your home. The hole can be drilled with a special hole saw. Make sure that the pipe is long enough to discharge the water away from the house or else it will just return to your basement. If you need to create a PVC elbow, you must use a special PVC glue in order to join the pipes. After the pipe exits the house, make sure it points downwards. Prepare the concrete mix and use it in order to fill in around the top of the basin. When you are done, level it with a pointed trowel. Finally, test your sump pump. Plug the device in and fill the basin with several gallons of water to see if it works properly. In conclusion, these 8 steps show you how to install a sump pump in your basement. The entire process usually takes about 6 to 8 hours. Whether you install the pump yourself or have a professional take care of it, it is certainly worth the time, effort, and money given the fact that you will not have to worry about flooded basements in the long run.